Difen B12 Tablets: Coated Tablets: Box of 15. Difen B12 Ampoules: Injectable solution: Ampoules of 3 ml: Box of 5. 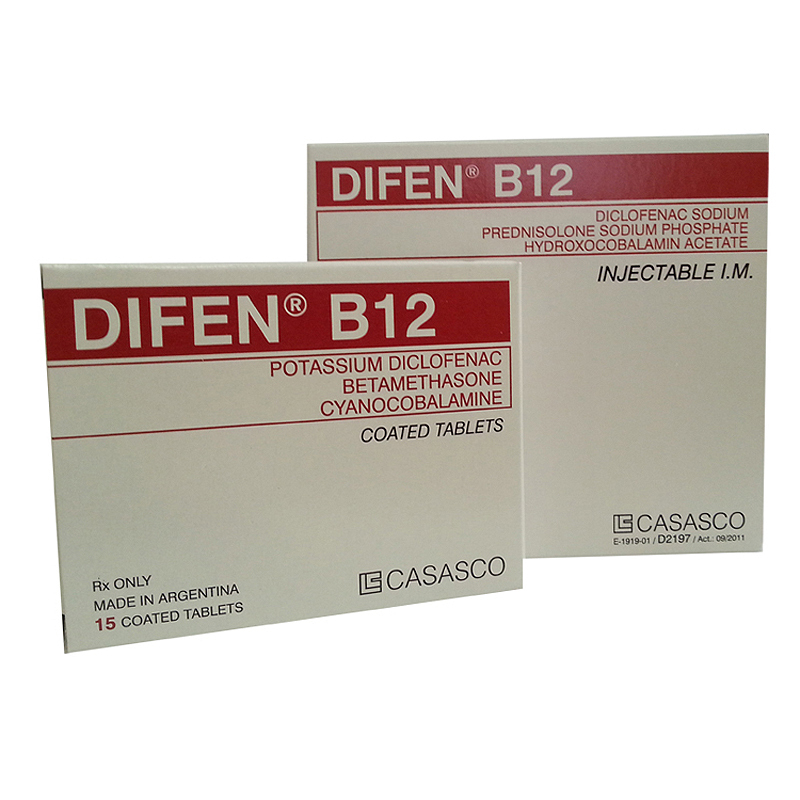 Difen B12 Tablets: Each tablet contains: Cyanocobalamin: 5 mg, Diclofenac potassium: 50 mg, Betamethasone: 0,30 mg. Excipients: Povidone K-30, Lactose, Corn starch, Microcrystalline Cellulose, Colloidal silica dioxide, Talc, Magnesium stearate, Hydroxyproylmethylcellulose, , Red aluminium lake 4R, Polyethyleneglycol 6000, Propyleneglycol, Sodium saccharine. Difen B12 Ampoules: Diclofenac sodium: 75 mg, Hydroxocobalamin acetate: 10,44 mg, Prednisolone sodium phosphate: 10,08 mg. Excipients: benzyl alcohol, propylen glycol, sodium metabisulfite, sodium hydroxide, water for injections. Diclofenac is a NSAI agent which has analgesic and anti-inflammatory action, mainly in the conditions that originates from somatic structures such as muscles and joints and especially those that are related to rheumatic and traumatic processes. This analgesic and anti-inflammatory action is due to the antagonism of bradykinin and due to inhibition of prostaglandin biosynthesis. The prednisolone, active metabolite of the prednisone, diffuses through the cell membrane, where it binds to the specific cytoplasmic receptors. Following, the complex enters the nucleus, where it binds to another transcriptional factor and to the DNA producing induction and gene rebuke, what finally leads to its anti-inflammatory, immunosuppressant and mineral corticoid effect. Vitamin B12 supplied as cyanocobalamin or hydroxocobalamin acts through its coenzymes in many metabolic processes including the synthesis of myelin, essential lipoprotein for the integrity of the nervous and peripheral system (antineuritic action). Diclofenac: The absorption starts immediately after administration. The amount absorbed is proportional to the dose. The pharmacokinetic profile does not change with repeated administration. There is no diclofenac accumulation if the intervals between intakes are respected. More than 99% is bound to proteins, mainly to the albumin. Diclofenac penetrates into the synovial fluid. Maximum concentrations are measured 2-4 hrs after the plasmatic peak. 2 hrs after reaching the maximum plasmatic concentration, the concentration of active drug is higher in the synovial fluid than in the plasma and the rest is reached in a period of 12 hrs. It has an hepatic metabolism, mainly because of the glucuro-conjugation of the molecule, with the formation of inactive metabolites. Elimination half-life is about 1-2 hrs. About 60% of the dose is eliminated via urine, less than 1% is excreted unchanged and the rest is eliminated through the bile in the feces modified. Prednisolone: It is quickly absorbed at the gastrointestinal level. The maximum plasmatic concentrations are obtained 1-2 hrs after its administration. It is highly bound to plasma proteins and its elimination half-life is 24 hrs, eliminated in the urine. A considerable proportion is excreted in unchanged form and another in the form of conjugated metabolites. The prednisolone crosses the placenta and it is excreted into breast milk in small amounts. Vitamin B12: It is absorbed quickly in the small intestine when it is administered orally. The presence of intrinsic factor is essential for its absorption. It is completely absorbed when it is administered parenterally. It has a high affinity for transcobalamin. It is metabolized in the liver and it is excreted in the urine, bile and secretions. Symptomatic and short term treatment when the patient does not respond to the monotherapy of acute inflammatory processes with neurotic, musculoskeletal contractures-sciatica. Known hypersensitivity to any component of the formula. Active gastroduodenal ulcer. Advanced liver disease, renal failure. Live vaccines. All infectious state where there is no specific indication. Certain evolving viruses (such as hepatitis, herpes, varicella zoster). Untreated or uncontrolled psychotic states. Pregnancy and lactation. Children under 15 years. Use the lowest effective dose to control the condition being treated. However the small amount of corticosteroid present in the preparation, doses should be adjusted according to the evolution of the condition and patient´s response, especially in situations of physical or emotional stress, surgery or injury. Dose reduction should be done gradually and should be done under medical surveillance. The rapid withdrawal of corticosteroid therapy can induce to a secondary renal failure. To avoid this problem, this withdrawal should be gradual. Anyway, a state of relative insuficiency may persist for several months after the discontinuation of the therapy, so any stress that occurs in this period requires reinstituting corticosteorid therapy or dose increase. The administration of live vaccines is contraindicated in patients receiving immunosuppressive doses of corticosteroids. If inactivated viral or bacterial vaccines are administered , the expected serum antibody response may not be obtained. Corticosteroids may mask some signs of infection, and new infections may appear during their use. There may be decreased resistance and inability to localize infection. Even more corticosteroids may affect the nitroblue tetrazolium test for bacterial infection and produce false-negative results. In cerebral malaria, a double-blind trial has shown that the use of corticosteroids is associated with prolonged coma and with a higher incidence of gastrointestinal bleeding and pneumonia. Corticosteroids may activate latent amebiasis. Therefore, it is recommended that latent or active amebiasis be ruled out before initiating corticosteroid therapy. Prolonged use of corticoids may result in posterior subcapsular cataracts, glaucoma with possible damage to the optic nerve and may enhance the establishment of viral and fungal infections . Patients who are on drugs that suppress the immune system are more susceptible to infection than healthy individuals. Similarly, corticosteroids should be used with great caution in patients with Strongyloides hyperinfection and dissemination with widespread larval migration, often accompanied by severe enterocolitis and potentially fatal Gram- sepsis. If corticosteroids are indicated in patients with latent tuberculosis or tuberculin reactivity, close observation is necessary since reactivation of the disease may occur. During a corticosteroid therapy, these patients should receive chemoprophylaxis. Literature reports suggest an apparent association between use of corticosteroids and left ventricular free wall rupture after a recent myocardial infarction; therefore, therapy with corticosteroids should be used cautiously in these patients. The withdrawal of corticosteroids after prolonged therapy may result in symptoms of the corticosteroid withdrawal syndrome consisting of fever, myalgia, arthralgia and malaise. This may occur in patients even without evidence of adrenal insufficiency. Corticosteroids should be used cautiously in patients with ocular herpes simplex because of the risk of corneal perforation. Corticoid effect is increased in patients with hypothyroidism or cirrhosis. During corticosteroid therapy may occur psychological disorders such as: euphoria, insomnia, mood swings, depression or personality disorders and even severe depression or psychosis. Also, existing psychotic tendencies or emotional instability may be aggravated by corticosteroids. Steroids should be used with caution in nonspecific ulcerative colitis, if there is a probability of impending perforation, abscess or other pyogenic infection as well as in diverticulitis, fresh intestinal anastomoses, active or latent peptic ulcer; renal insufficiency, hypertension, osteoporosis and myasthenia gravis. Gastrointestinal effects: Concomitant use of diclofenac and prednisolone in the treatment of arthritis may provide additional therapeutic benefit and permit reduction of glucocorticoid dosage. However, in patients treated with diclofenac and glucocorticoids, the risk of peptic ulcer and gastrointestinal bleeding may increase, so special attention should be given in case of prolonged treatment, even in the absence of serious gastrointestinal symptoms. It is recommended using the lowest possible effective dosage to get a satisfactory therapeutic response. Patients with a prior history of serious gastrointestinal adverse events and other known risk factors that are associated with peptic ulcer disease ( alcoholism, smoking) are at increased risk. Elderly or debilitated patients seem to have a lower tolerance to ulceration or bleeding. Most spontaneous reports of fatal gastrointestinal events are in this population. Hepatic effets: Elevations of one or more of the liver enzymes may occur with diclofenac treatment. These laboratory abnormalities may progress, may remain unchanged or may be transient with continuing therapy. It is recommended to monitor the GPT to monitor hepatic injury. Periodic transaminases measurements should be made during prolonged treatment with diclofenac because severe hepatotoxicity may develop without a prodrome of distinguishing symptoms. The physician should provide information to the patient about the signs and symptoms of hepatotoxiciy that should cause alarm (e.g., nausea, fatigue, lethargy, pruritus, jaundice, right upper quadrant tenderness and "flu-like" symptoms). Allergic reactions: Allergic reactions including anaphylaxis have been reported with diclofenac and glucocorticoids. Specific allergic manifestations consisting of swelling of eyelids, lips, pharynx and larynx, urticaria, asthma, and bronchospasm, sometimes with a concomitant fall in blood pressure. The appearance of an asthma attack in some patients may be related to allergy to aspirin or other NSAIDs. In these cases, medication is contraindicated. Fluid retention and edema: During treatment with glucocorticoids and diclofenac, edema and fluid retention have been observed so the formula must be used with caution in patients with a history of decompensation, hypertension or other factors predisposing to fluid retention. Dietary salt restriction and potassium supplementation may be necessary. All corticosteroids increase calcium excretion. Renal effects: Rare cases of interstitial nephritis and capillary necrosis have been reported in patients treated with diclofenac. Another form of renal toxicity, generally associated with NSAIDs, is seen in patients with prerenal conditions leading to the reduction in renal blood flow or blood volume, where the renal prostaglandins have a supportive role in maintaining renal perfusion. In these patients, administration of an NSAID may cause a dose-dependant reduction in prostaglandin formation and, secondarily, in renal blood flow, which may precipitate overt renal failure. Patients at greatest risk of this reaction are those with impaired renal function, heart failure, liver dysfunction, those using diuretics concomitantly and the elderly. Discontinuation of NSAID therapy is usually followed by the recovery to the clinical status and laboratory values of the pretreatment state. As diclofenac metabolites are eliminated primarily by the kidney, patients with renal insufficiency close monitoring of the patient's renal function is advisable. Laboratory tests: Diclofenac prolongs platelet aggregation without affecting the bleeding time, plasma fibrinogen and factors V and VII to XII. Diclofenac, however, like all drugs that inhibit prostaglandin synthesis interfere with platelet function to some degree. Therefore, patients who may be affected by this action should be observed carefully. Kidney failure and liver damage: Untill now, studies in patients with liver damage or renal failure did not detect pharmacokinetic differences, in normal individuals. However we recommend strict monitoring of these patients. Pediatric use: Indications and dosage guidelines for children use, have been established over 15 years. Geriatric use: Elderly patients may be more sensitive to NSAIDs, so it is recommended to use the lowest effective dose. The elderly are more likely than younger adults to develop high blood pressure. Postmenopausal women may have a predisposition to osteoporosis induced by glucocorticoids. - Aspirin: because it alters the bioavailability of both drugs. - Anticoagulants: because it can alter platelet function. Coadministration of warfarin should be monitored carefully. - Digoxin, methotrexate, cyclosporine: because it can increase the toxicity of these drugs through their effects on renal prostaglandins. - Lithium: because it reduces the renal clearance and increases lithium levels in plasma which increases the risk of lithium toxicity. - Oral hypoglycemic agents, Insulin: the physician should consider that, in diabetic patients may alter their responsiveness to these drugs. - Diuretics: because it can inhibit their activity. Simultaneous administration of potassium-sparing diuretics may be associated with increased serum potassium concentration. - Quinolones antibacterial: seizures have been reported during concomitant use of these compounds. - Antihipertensive agents: NSAIDs may reduce hypotensive effects including ACE inhibitors. - when potassium-losing diuretic, laxative or amphotericin B have been given concomitantly or when the patient has vomiting or diarrhea. - when the patient receives any medication concomitantly which toxicity is increased due to hypokalemia like digoxin and neuromuscular blocking agents. - when there is risk of torsades de pointes, for example in patients with prolonged QT, concomitant administration of other medications that produce torsades de pointes (amiodarone, quinidine, bepridil, IV erythromycin, halofrantine, pentamidine, sparfloxacin, sultopride, vincamine, betrilio, disopyramide, sotalol, etc). Fluid retention might diminish the effect of antihypertensive drugs. May reduce the action of interferon alpha. Antacids may decrease the absorption of steroids and this may require dose adjustment, especially in patients receiving low doses. - Barbiturates, carbamazepine, phenytoin, rifampin or ephedrine: these drugs enhance the metabolism of corticosteroids reducing their therapeutic action. - Diuretics that produce potassium depletion (thiazides, furosemide) by increasing the potassium depletion and the risk of severe hypokalemia. Pregnancy: Safe use of this medicine in pregnancy has not been established. Therefore, its administration requires that potential benefits to the mother outweigh the risks to the fetus. Drugs known to inhibit prostaglandin synthesis and release (increase the incidence of early closure of patent ductus arteriosus) are not recommended. Infants born of mothers who have received corticosteoirdes during pregnancy should be carefully observed for signs of hypoadrenalism. Lactation: Corticosteroids appear in human milk and could suppress growth, interfere with endogenous corticosteroid production or other unwanted effects. Mothers taking pharmacologic doses of corticosteroids should be advised not to nurse. The following side effects attributed to diclofenac were reported. Incidence < 1 %: vomiting, jaundice, melena, stomatitis, thrush, dry mouth, thrush and mucous membranes, bloody diarrhea, hepatitis, hepatic necrosis, changes in appetite, pancreatitis with or without concomitant hepatitis, colitis. Incidence > 1 %: abdominal pain and cramps, headache, fluid retention, bloating. Incidence < 1 %: asthenia, swelling of the lips and tongue swelling , photosensitivity, anaphylaxis, anaphylactoid reactions. Dermatological: impaired wound healing, atrophy and thinning of the skin, fragile skin, petechiae and ecchymoses, facial erythema, increased sweating, suppression of reactions to skin tests, allergic dermatitis, urticaria, and angioedema. Coated tablets: 1 coated tablet 2 times a day. If it is necessary it can be administered up to 1 tablet 3 times a day. To be taken preferably after food. Length of treatment will be defined by medical criteria. IM injection: one ampoule once a day. If it is necessary it can be administered up to 1 ampoule 2 times a day. - Perfect sterility of the instruments is required. - Use a needle long enough 8/0 mm. - Press the plunger down slowly to inject. - Inject in the superior external quadrant of the buttock, in a perpendicular direction to the iliac spine. - Perform a circular massage on the desired point of application to enhance the distribution and absorption of Difen B12. - In the case of any local internal leg pain, interrupt the administration, withdraw the needle and apply elsewhere in the area. Rare cases of toxicity have been reported or death by overdose with glucocorticoids. Symptoms following acute NSAID overdose are usually limited to lethargy, drowsiness, nausea, vomiting and epigastric pain, gastrointestinal bleeding can occur but very rarely, hypertension, acute renal failure, respiratory depression and coma. The initial management of overdose: After a careful clinical evaluation of the patient the importance of time elapsed since last ingestion or administration, the amount of poison swallowed and discarding the contraindication of certain procedures, the professional will decide whether or not the treatment of general rescue: emesis or gastric lavage, activated charcoal and saline purgative (45 to 60 minutes after the activated carbon), hemodialysis. Coated Tablets: Store in a dry place, temperature below 30°C. Injection: Store in a dry place, protected from light, temperature below 30°C.